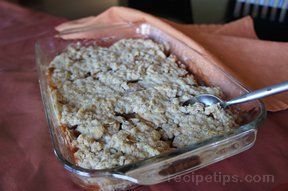 Mix the oatmeal, brown sugar, salt, cinnamon and baking powder in a large bowl. In a separate bowl, beat eggs with wire whisk. Add applesauce and milk. Combine liquid ingredients with dry ingredients. Stir in apples and raisins. Pour into a greased 8x12" glass baking dish. Bake at 350° for 30 to 40 minutes or until edges are lightly browned and center is done. Serve warm with milk or ice cream. Serves 18.